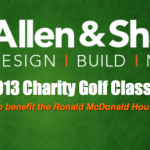 Allen & Shariff is pleased to announce the 1st Annual Allen & Shariff Charity Golf Classic. With spring around the corner and many of us planning summer activities, what a wonderful way to enjoy a day off of work and for such a worthy cause. The event will be benefiting the Ronald McDonald House in Baltimore, Maryland who provides housing for seriously ill children and their families, and helps to fund programs in the local area that directly improve the well-being of children. Please forward your questions to golf@allenshariff.com and don’t forget to register and pay before July 31, 2013. We look forward to seeing you on the course!